HALLIE EPHRON: It's hard to look at clouds without the lyrics from Joni Mitchell's "Both Sides Now" bubbling up, and with it the poetic images that are her trademark -- ice cream castles; feathered canyons; moons and Junes and Ferris wheels -- along with them the dark edginess that makes her lyrics as thought provoking as her music is inspirational. 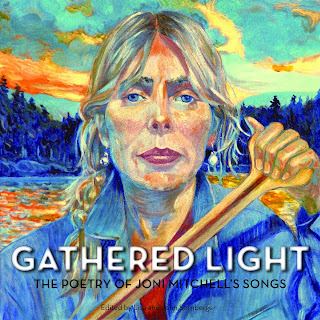 Now Lisa Sornberger and John Sornberger have put together "Gathered Light," an anthology of works by 56 contributors inspired by Joni's lyrics. We're delighted to welcome Lisa to Jungle Red. First I have to ask about the cover. It's a gorgeous watercolor of Joni, paddling away from a vivid, psychedelic sunset against horizon outlined by dark pines. Lisa, tell us about that cover. 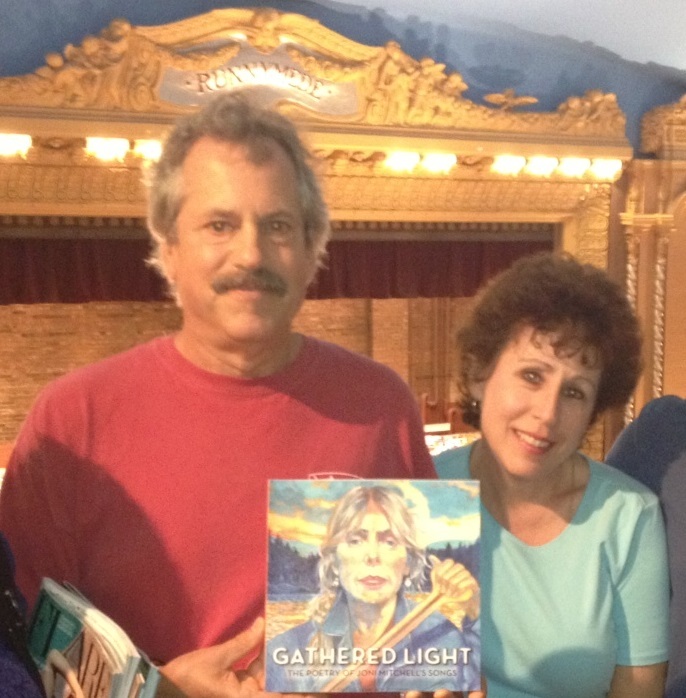 LISA SORNBERGER: I’m thrilled that you like Joni’s gorgeous painting that graces our cover. It fits in terms of the theme of our book, and the way we see Joni, a genuine explorer. Plus it's reflective of her First Nations heritage (Sami), which matters to her. We hope readers like the way it ties in with the opening quote from Emily Carr, one of Joni’s favorite writers and painters, and our foreword. All of that came after the painting. HALLIE: How did you connect personally to Joni Mitchell and her works? LISA: Joni has had a profound influence on my life since I was fifteen years old. She opened my spirit to freedom, and helped validate the path of becoming a writer. She brought sustenance and joy, and, I think, taught by example, that (real) poetry serves an essential function in this world. She writes her way through shadows and light, exploring the truth, about feelings and life, in ways that transcend the personal. The idea of the project came to me on New Year’s Day, two and a half years ago, pretty much fully-formed: we needed to do this book, to honor Joni’s work as a poet. HALLIE: What was Joni Mitchell's reaction to your project? LISA: She was happy, and gracious, and I think a bit surprised that we wanted to focus on her work as a poet. Also, that it wasn’t “mercenary”. HALLIE: What do you think it is about her songs that have made them so iconic? LISA: Well, she is brilliant. She makes multi-level sensory connections. She has an incredible gift for translating visual images into artful, astute language. Her poems are full of truth, and heart, and we believe anyone willing to take a look at themselves will find resonance in her words. HALLIE: Who are some of your contributors, and can you give us a taste of what's in "Gathered Light "? LISA: About half of our contributors are poets. Fred Wah is the Poet Laureate of Canada. Other prize-winning poets, including Cornelius Eady, Bessy Reyna, Patricia Smith, Colleen McElroy, Pit Pinegar, Beth Cuthand, Louise B. Halfe, Susan Deer Cloud. We've got friends of Joni's, like her ex-husband Larry Klein, David Geffen, three of her female friends. Wally Lamb, the extraordinary novelist, is a contributor. We love that our contributors are diverse -- age ranges from about 19-79; men, women; straight, LGB, T; Third Nations, Latina; white, black, red; Buddhist, Atheist, Jewish, Agnostic, Christian... The point being, Joni's poetry transcends artificial boundaries. The “assignment” was to pick just one of Joni's poems (lyrics), and to write about how it sparked you, inspired you, spoke to you personally, politically, or from a societal viewpoint. Writers could respond in their genre, or another. Just write from your “heart and mind,” tell your truth. HALLIE: Taking the cue from Joni herself. Thanks, Lisa. Have Joni Mitchell's words and music touched your life? Of the artist whose music shaped you, whose poetry have responded to as much as much as the tunes? Joni Mitchell's on my list... along with Paul Simon and Bob Dylan and Carly Simon. Lisa and John are offering a free book to one lucky commenter. Ah, Joni Mitchell songs . . . “Both Sides Now” . . . “Favorite Colour” . . . “Gemini Twin” . . . it’s all good . . . .
Others? Bobby Troup . . . “Just the Way I Am” . . . “Their Hearts Were Full of Spring” . . . .
Joni had a major influence on my life. Her voice, her lyrics, her attitude. I can hear one of her songs and be right back where I was when I listened to it non-stop. For example, Hissing of Summer Lawns? I was teaching English in the Tokyo area! What a wonderful book you have put together. Edith, this does not surprise me! Hissing of Summer Lawns - a favorite of mine, too. And what an image. I am not familiar with "Favorite Colour" or "Gemini Twin"...will have to look for in her catalogue! Thanks! That was me- not anonymous! Wonderful post--what a fascinating idea! and I love your early picture--I bet you guys still feel like that inside:). Oh yeah. Blue -- the Blue album. They were so big back then. The art. You held the art. You looked at it. You read the story. All the words. You slid the vinyl record out. Careful not to touch the grooves. Piece of art with a music surprise inside. Reine! THAT is poetry! Lovely. Lisa, the more I think about Joni's words the darker they seem. Or is that just me? I used to love to sit by the stereo, listen to the albums while I read the words...they were beautiful books with fantastic art covers, weren't they? Thanks, Hallie. Love this blog. Night. 1F4 I've always been partial to Joni's "The Magdelene Laundries." Something about those lyrics and the subject matter seemed like a perfect match. As for other artists who lyrics are poetry to my ears: Leonard Cohen, Rufus Wainwright and Tori Amos. All of them (Joni included) tend to be artists whose words can be studied and at different times in ones life, different emotions will resonate. it seems to me that Joni, like a lot of poets,writes her way through the dark- explores deep feelings, contradictions- resolves them via the poems. And in doing so, gives us a chance to follow. So it ends on a hopeful note, usually, for me. Lisa, yes. You wouldn't buy an album if you didn't like the cover. Right? Kristopher, Two of our writers wrote about "The Magdalene Laundries"- Brooke Elise Axtell and Wally Lamb.I believe Joni was actually given an award for helping them to get closed. Oh I could never have made it through college..and beyond , without Joni Mitchell. I cannot even begin to tell you..although I bet, Lisa, you hear that all the time. I wish I had a river, I could sail away on..
And I even now, on days I am happy, I love to play "The wind is in from Africa, last night I couldn't sleep...."
Let's go down to the mermaid cafe, and I will buy you a bottle of wine..
oh, it makes me smile just to think of it. Hank, Oh, Carey get out your cane! Such joy in some of those songs- makes me think of "All I Want"! Joni definitely explores the depths of joy too! And I wouldn't have even gotten through high school without her- know what you mean! All- Sorry if I'm slow at this- not techie- I have to keep proving to my computer that I'm not a robot. Oh Lisa... Hahaha! Yeah. The White Album. Now that was ugly. But who could not look at it. The music worked great. Beat the hell out of "I got a brand-new pair of rollerskates…" I'll never get to sleep now. This link will take you to a listing of songs Joni wrote and/or recorded. You'll find the lyrics for both "Favorite Colour" and "Gemini Twin" here . . . .
Hi folks - Hope it's ok for me to join in. I was 15 years old with Lisa discovering Joni Mitchell (and Dylan and Neil Young). So I commented on Chinese Cafe, in the context of my friendship with Lisa over the years - like a sweet song from years ago that still makes me feel youthful today. I had more room for darkness when I was younger. Now I hear the sweeetness. Reine, Oh I remember that Melanie song. Actually, I love some of her writing- some very powerful poems (not that ditty). Good dreams! Joan- I'm excited I'll get to hear these songs- wow- thank you! Hallie- This is really fun! One thing I forgot to mention is that up to two writers cover the same song (ok- 3 in one case)- love that juxtaposition of voices! "I had more room for darkness when I was younger." - what an interesting observation, Jill McAllister. I find that's true for me with movies and books, too. And these days everything seems SO dark and why are they all yelling? Jill, if you're still there, can you give us an idea what your essay (poem?) was about... beyond the Chinese Cafe inspiration? Thank you Hallie - I find it intriguing the way Joni had a song within a song. The primary song does have a sorrow to it, lamenting the passage of time, while the "inside" song is happy and carefree. For many people, Joni herself pulls a sweet past into their present when they listen - or even remembering listening to her. So many comments here this morning reflect this. Joni Mitchell - she always makes you think. Lisa, you should tell them about your 8th grade thesis paper - the seed for this book? Would people like to know more about how the book evolved? I touched on that a bit. So, imagine this- when I was 15 or 16, I wrote a really terrible high school paper, called "Joni Mitchell, Portrait of a Poet and a Painter". I think it was churning around in me, this idea- to honor her in this way. How often do you really get to publicly thank someone who has been there as a Muse most of your life? Anyway- two and a half years ago, as I said earlier, the idea arrived. I brought it to my poets group. They were into it! So great! Then I started contacting people- people mentioned in songs, poets I admire, writers who adore Joni- and the response was amazing! Unfortunately, some very prominent poets were too weighted down with our projects at the time- but I've saved their names, should their be another. I'd include friends of Joni's who I didn't know about. And of course, more people who love her words just as much as we do- maybe via a lottery on her webpage? I'd pick certain poems I badly wish we'd cover. I'd ask for her input, though she is very modest and doesn't not like to "toot her own horn". Just for feedback, vision. I meant with other projects- not our projects! I am not a morning person- can you tell? :)Coffee # 3 is on the way! Lisa's assignment was to write about how Joni's poetry has had an effect on you. The result was a very diverse range of interpretations of the assignment. So in some cases, a song might be viewed from an academic perspective, woven together with personal reflection. Others are purely emotional responses to one of her pieces. I find myself returning again and again to these essays and poems. The cumulative effect of all the contributions is a rewarding intellectual and emotional experience. I keep the book close at hand and dip into it frequently. I am honored to be a small part of it. Can you tell us more about the editorial process? For my part it was a joy working with you. You have truly honored Joni's artistry. Well, I've said this many times, but I'm honored to be part of this collection. I always liked Joni's music and felt that it truly was poety at its best, but I have to admit I was not a full-bore Joni freak until Blue, Court and Spark, Hegira, and on. Then when she collaborated with Mingus, I knew she was -- what -- a princess of the tribe, way up in the pantheon. "Trouble Child" was a revelation to me. I was living in LA, struggling to do music and writing and having enormous highs and lows on a daily basis. My friends and I made great music, but there was usually a price. When someone put "Court and Spark" on the turntable and up came "Trouble Child," it was as if Joni had drilled down into my deepest, darkest thoughts and exposed the lost souls who dwell there. But it was balm for me as well. I transferred her words and ideas, whatever and whoever she was talking about, to my own roster of the fallen and the crippled in spirit. She has that way about her, doesn't she????? My small part of "Gathered Light" was my purging, my epiphany, my remembrance of those who didn't reach the finish line. For that, Lisa, you will always have my friendship and gratitude. You too, Joni! BTW, on my post, I don't know who "outlaw" is. I'm Steve. Jill- Thanks for explaining that- it's helpful. Richard, I so enjoyed working with you too. And re: the editorial process- sure. To be honest, I had to ask a few contributors to leave early on. If I didn't feel that they fully appreciated Joni the poet- what was the point. If there was evolution in their process, fine. We tried not to edit too much- such astute writers- and didn't want to be the opinion police- Richard, I love that thanks to you and the others, we cover a huge range- the scope of the project was to give Joni credentials in literary circles, where I truthfully believe she already had them, but she, I think, felt dissed in some ways...rightly so... and to acknowledge her power to influence us all on a deeply personal level. I never wanted to come close to Joni's personal life- perhaps some of the pieces did, in retrospect, as the authors wrote from their own depths- but it was only because she inspires people to tell their truths! Not necessarily accurate- but impressions. I think and hope that overall, she got the heart and spirit of it. We were bleary-eyed at the end. Steve (you Outlaw- just kidding!). Your presence in the book is a gem. Each piece made me look at things in a new light- open to new interpretations. If it did those things for you, while it acknowledged Joni so beautifully, I am most grateful.You brought more than you know...and have been a great support. Ditto for Richard Flynn! I think that Joni is well loved in literary circles. Most of my fellow poets and critics were very excited to learn of the book. For me Joni was a formative influence for my love of poetry as well as song, I really believe she is one of the big reasons I grew up to be a poet & critic! See what great writers we have? What a pleasure it's been- true collaboration- I have learned so much in the process. And, for my part, love all of the different voices...would anyone want to read 56 essays by moi on Joni- hardly think so- would be boring! I want to add that the more academic pieces, if you will, are full of heart, and the more personal pieces- very intelligent. I can brag about our writers, right? Can you tell I'm passionate about our subject? Any ??? "s Keep 'em coming please- it's fun! Rich, I am glad to hear that- I hope Joni will get to read this- I sensed she felt like some critics were all about Cohen and Dylan (who she truly respects), but treated her as less than. One in particular said she wasn't a poet, because she hadn't written a book. That just is...not so. Why would anyway say that? Lisa: Thanks for mentioning my book! The essays in your book cover so many aspects of Joni's writing, with so many beautiful minds responding to her work. Is there anything in particular you're especially eager to hear about from Joni herself? (Since she's working on her memoir now, we've heard). Wsnt to let you all know about a couple of upcoming events you are invited to! Michelle, yes! I hope in my heart too that all of the appreciation has gone to her core- as you beautifully stated. It's not like she needs our approval- goodness knows- but still, to know she knows.I will say I most enjoyed discussing the creative process with her...to hear her say "yes, it's like that" not in so many words...about how poems come. I could do that with her all day long...as I'll bet you could with music too! p.s.- I'm here for 15 minutes more, but will be happy to comment on posts received after 12 p.m. EST later in the day! Hallie- This has been really great- thank you for this opportunity! (p.s.- I've got a copy of your "Never Tell A Lie" waiting for me this week- excited! )Am I allowed to say that? Well, it's true! Yes, Lisa! I've treasured those moments of rapport and understanding with Joni, too. We'll have to wait and see what she does with the memoir--and she'll surprise us. So fun to chat here. Thanks for the book! I agree that I'd like to hear about that songwriting process, too. Though she spoke about it in general in those long interviews recently, I'd love to hear about specific songs as well. Frankly, I'd also like her to wrestle with her ego enough that she would talk about her communities of fellow artists during various phases of her career--not gossip so much as an appreciation of her contexts. She appears to be writing the memoir with Dragon dictation software. should be interesting in any event! And interesting re: Dragon Speak. Curious about Malka Marom's project too! Loved talking with you (all)! I so love Joni Mitchell. The thing that really stands out to me is how her music is standing the test of time. The Boy, a 19-year-old folk metal/EDM/jazz aficionado, likes her songs as much as I do. So, Lisa, where is Bunch of Grapes? Is it a bookstore? Wondering if it's possible I could make that Sept. 11 event. In any event, I'll be at UConn Sept. 26. Julia- Curious about who the boy is- or did you mean the youngest contributor to our book? I can tell you about him- what a talented guy! To Jody- Thank You very much! To Hallie- What a read it will be- I wonder if she will focus on "process" a lot- she is so smart and quick, and very very funny! To Steve- "Bunch of Grapes" is at Martha's Vineyard, in Vineyard Haven. Would love for you to come. Hi Lisa! Sorry I'm so late to this fabulous discussion today! Every Joni song triggers a memory and an emotional response. What a remarkable talent, and disgrace if she is not considered in the same league as Simon/Dylan/Cohen. Julia, I love it that your Boy loves Joni, too. I'm glad to see this book has been put together and would like to look it over in person sometime... I was recently talking with someone about how much Joni Mitchell has meant to me in the two to three years as I moved to a small town and just generally entered my forties and found myself seeking solitude and reflecting on life. And he said that everyone goes through a Joni Mitchell period, which made a lot of sense to me. Only in my case, I hope to savor her music bit by bit for the rest of my life and hope not to limit it to a period, as she is a prodigious writer/songstress with so many different shades and periods... I just plan to take my time. It's fun to relearn songs I heard and liked as a girl, and it's fun to hear songs sung by others in her own voice. And I love her early folky tunes and feel their timelessness especially. So I hope it's a long journey... but I hope someone collects her art as well. I like what I've seen on the website and want to see more. Best!